Some of the best meals are the easiest to make. I think that is true with these crispy coconut chicken tenders. Say that five times fast. There’s not a lot of steps to this recipe, which makes it ideal for football Sunday when you have to feed a bunch of hungry people or during the week when you’re feeling ravenous after work because you ran out of apples so you did not have your afternoon snack (I assume). Prepare all of your ingredients in separate bowls, adding the seasonings to the coconut. 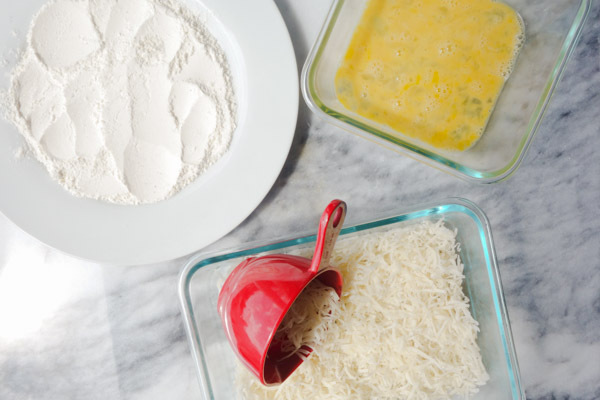 I find it easier to put the flour on a plate and the egg and coconut in shallow bowls or dishes. Preheat the oven to 350 degrees. Rinse the chicken and remove any fat. If you do not find chicken tenders at your local grocery store, use chicken breasts sliced to be about 1/2 inch thick. Mix the bread crumbs with the coconut. This is going to be the outer layer that turns golden and crispy when you bake it. Get excited. Dip both sides of the chicken tender in the flour, the egg, and the coconut breading in that order. Place the chicken tender on a baking sheet sprayed with coconut oil spray or non-stick cooking spray. Repeat those steps with all of your chicken tenders. You can line them up fairly close together. 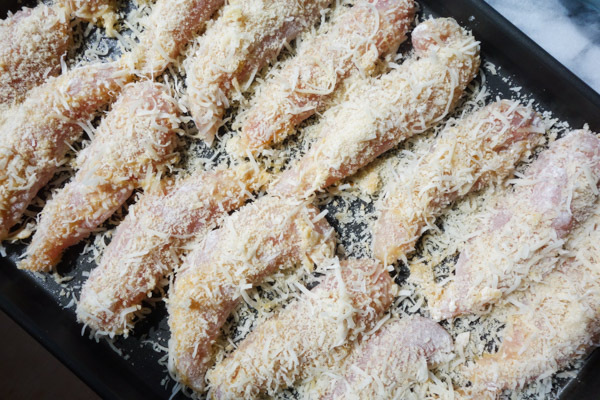 After 15 minutes baking in the oven, flip the chicken tenders. Cook the chicken tenders for another 10 minutes or until they are golden brown and crispy. Serve them with your favorite dipping sauce. I mix a tablespoon of honey with four tablespoons of dijon mustard to make a spicy honey mustard. Enjoy and GO [insert your favorite sports team, but especially Minnesota here]! Rinse chicken tenders and remove any fat. 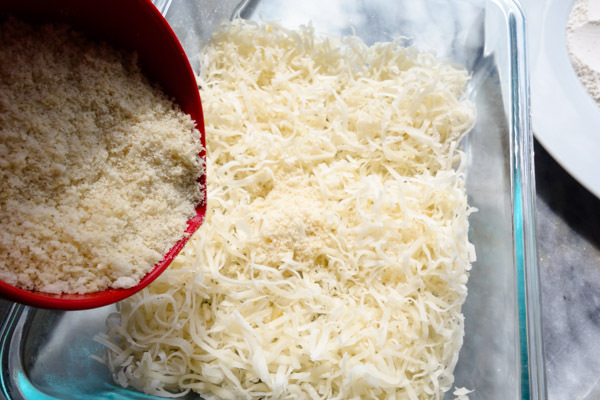 Mix coconut and bread crumbs in a shallow bowl or on a plate. Mix flour and seasonings in separate shallow bowl or on a plate. Whisk egg in shallow bowl. Coat both sides of chicken tender in flour. Coat both sides of chicken tender in egg. Coat both sides of chicken tender in coconut mixture. Place chicken tender on lightly greased baking sheet. Repeat with all chicken tenders. Bake chicken tenders for 15 minutes. Using tongs, flip tenders. Bake for an additional 10 minutes or until tenders are no longer pink. 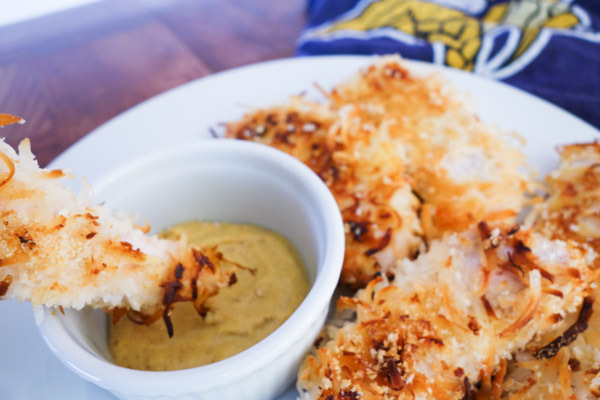 Serve tenders with favorite dipping sauce. Bring on the FOOTBALL FOOOOOD!!! Love coconut and these bites! I love coconut! These look great!